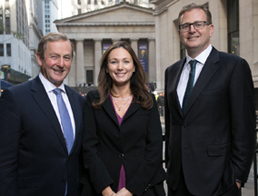 Enda Kenny TD, Former Taoiseach speaks to Matheson’s Managing Partner, Michael Jackson, and Partner, Liz Grace, in one of his first interviews on Brexit since leaving the Office of Taoiseach. In a number of questions put forward to Mr. Kenny by Matheson at New York’s Four Seasons Hotel, Liz Grace asks him to describe what would be the consequences of a hard Brexit, if this were to happen, to which Mr Kenny replies “potentially catastrophic”, adding that the “transition period will last much longer than people imagine”. In the interview, Mr Kenny says it is important that the Brexit talks achieve progress as companies need to have clarity and certainty. “We are an island nation, we have to export up to 90% of what we produce and for American investment, or foreign direct investment, which Matheson deals with on a regular basis, stability and certainty is critical,” adds Mr Kenny. What is the likelihood of Brexit negotiations moving from divorce to trade talks by next March? What are the prospects of negotiations breaking down and a hard Brexit? What would be the consequences of a hard Brexit? Will Britain get a transitional deal and how long could, or should, it be for? The impact for Ireland of the UK’s departure? What is the best way forward in respect of the Northern Ireland border? Is the EU being too tough on the UK?